Nice of you to say, but I reckon you've nail on the head in one paragraph compared to my usual 12! A beautiful, but supposedly immoral woman and daughter (Ingrid Bergman) of a convicted war criminal, is persuaded to spy on Nazis at work in Rio. Before the job begins, she and her agent contact, Devlin (Cary Grant), fall in love. Their real feelings must be hidden, even from each other when she marries one of the group, Alex (Claude Rains), and her situation grows desperate. 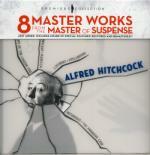 This phenomenal and intense film is a milestone in Hitchcock’s career, with a distinct shift in style and confidence; every shot and setup is full of invention, yet never feels experimental while he stamps his authority on the suspense genre. 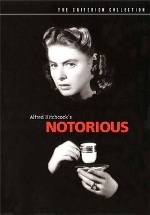 Look the word up in the dictionary and it should say, “watch Notorious, and try not to hold your breath”. He puts Bergman and Grant through absolute torment and the sequences with the wine cellar key are particularly nerve shredding. The plot is delivered similar to Shadow of a Doubt, in that there are no big set-pieces and it is driven by subtleties of human character, while defining earlier themes. We have a secretive Gentleman’s Club of Fifth Columnists (or SPECTRE perhaps. Still watching, Mr. Fleming? ), with an older woman (Leopoldine Konstantin) possibly at their head, such as the ones in Saboteur, except these have real menace behind their formal exterior (mainly down to Ivan Triesault) and none of the silliness. Although the motivation is completely different, the wonderful Bergman has similar situations to deal with as seen in both Rebecca and Suspicion, and delivers a spellbinding performance, especially well-judged with Casablanca co-star Claude Rains. Rain’s is one of several characters that could have gone quite wrong, but ends up very much the opposite. Another is Cary Grant’s, here with a character that he deserves, playing up to, rather than against his romantic movie star image while allowing him to get his teeth into the role. It suggests that had Suspicion been allowed to unfold properly, it would still have felt wrong. He was a very good, but underrated actor and this is amongst his best work. Just watch his face as he delivers “one below the belt” to Bergman. They work together beautifully, enhanced by Ted Tetzlaff’s gorgeous photography, creating a tangible sense of longing. As Rich commented, Bergman's eyes are hypnotic. Once again the myth that Hitchcock didn’t work well with actors is shamed. The dialogue is note-perfect and sophisticated, especially when Grant is dealing with his superiors who dismiss Bergman as a drunken tart. Or later, in the nail-biting finale on the stairs. This was a Selznick production and I don’t think they ever worked together better, with the producer successfully negotiating with Hollywood’s morals and even J. Edgar Hoover! You would never know several concessions had to be made to the script, as usual. The Criterion disc is predictably superb and the booklet theorises that Notorious was Hitchcock’s first true American thriller, but he wouldn’t again capture the heart and sympathy he has here. I don’t think that’s true, but certainly the balance between romance and thriller is rarely so well executed by anyone, never mind Hitchcock. This is a cinematic milestone as well. I had been after that Criterion for quite some time, unfortuenaly I only started looking after it had already gone OOP. Well I hope to get through a few more soon. Just been a busy few weeks for me. Why you feel it doesn't look promising...? Sure, being compared to Criterion it's in a tough spot... Problem I see is, since MGM released it themselves just last year I doubt they will pass the rights to Criterion aghain any time soon for a Blu-ray release; maybe they'll do it themselves though? PlayTrade looks like eBay handled by play.com...? I don't think I want to spend £35.00 for the film, then I'd rather get the MGM version for approx $12. It's a bit of a gap in my collection, but not that big. I'm a silly sod. Misread your post. I thought you meant you'd found stock of the Criterion. But that MGM release looks good. MGM do tend to release decent editions of their titles that have already appeared on Criterion. It's like they frown and say, "oops, I suppose we could put a little more effort in"
Yeah, Play is seller friendly. The guy knows it doesn't exist now so he charges what he likes! Meanwhile, I just sold a seven year old DVD of Babylon 5 (pilot and another TV movie) that cost me £10, for £7.50 (after fees)! Good, I thought you had info the MGM had problems or such. I'll keep on the Wish List then and probably add it to the order during the DeepDiscount.com sale (hopefully 20% rather than the rumored 15%). I did watch Rebecca last night..I'll be back later to write about it when I have more time. I also realized that I don't have Suspicion. I have no clue why I thought I did, but I don't, so I won't be watching that one. Laurence Olivier, Joan Fontaine and Judith Anderson headline this Best Picture Oscar® Winner based on Daphne Du Manner's novel about a man's fatal obsession with his late wife. Restored and Remastered! Includes Audio Commentary, two Featurettes, Screen Tests, Audio Interviews with Peter Bogdanovich and Francois Truffaut and More! I really enjoyed this one. Some scenes do move a tad slower, but that works since it allows for the suspense and tension to build up more. The movie has a rather creepy atmosphere overall, which is established during the first few minutes with the shot following the very long drive up to Manderley. The house was actual a model, which looked amazingly realistic. There are a few other elements that Hitchcock is known for, but none of the bits of humor. Hitchcock had a ...well...complicated working relationship with the producer, Selznick. The one extra on my copy that is focused on the making of the movie does share a lot about the tensions between the two men. Only a little bit of time is taken to show the characters meeting and spending some time together before they decide to get married. Then they go to Manderley, where she is very overwhelmed by the huge house, staff, and especially Mrs. Danvers, the housekeeper. Many things around the house have been kept the same since Rebecca died, which only adds to the new bride's feelings of inadequacy. Most of the movie takes place around Manderley, and the house is very imposing and important to what is going on, almost like another character. Things in the house do seem a bit creepy, especially when Mrs. Danvers gives a tour of Rebecca's room. Mrs. Danvers is downright creepy, but in a subtle way. She acts like she is being helpful when she isn't. The woman does not seem stable and ends up being a wonderful villain. There is no way any sane person would want her for a housekeeper. My copy of the DVD has a featurette on the making of the movie and one of Daphe Du Maurier, both of which are entertaining and interesting. I have a longer review in progress that I'm going to post on Epinions.